The PowerX Handguard is 20% smaller and much lighter than the Star Series Hanguard. 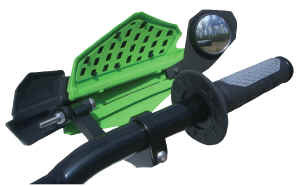 The FlexMount(TM) universal mounting system was engineered to flex upon impact! This allows the guard to provide great roost protection while being more durable and longer lasting. The guard and mount come with PowerMadd's exclusive "1 Year - No Questions Asked" warranty. Please let us know if you would like the Dirt Bike mount instead. Fully adjustable and independent of existing throttle. Works on carburetors up to 50mm. No modifications to existing cables. Must order riser block (below) seperately. Black anodized finish and allows your sled to accept the new style riser blocks.